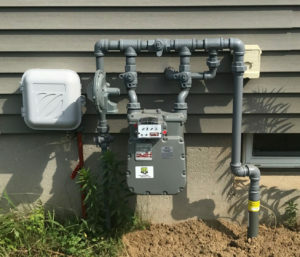 This homeowner wanted a generator that would run on the natural gas that he currently uses to heat his home with. We were able to provide power to the entire 1400 square foot home with a 12kw. Natural gas is a great fuel source for residential generators. Unlike propane, it is piped directly to your home so you don’t have to worry about a delivery truck getting to you during a storm. The gas meter also needed to be upgraded as a part of the project. This project is complete and the family that resides in this home can relax during future outages with their new backup power system.